A Gnome Roast: A Huffington Post Exclusive~! Because greedy relatives and drunken sisters are just half the fun of it all! And get ready for this week’s Happy Hour of Horrors, coming early in time for Thanksgiving. I’ll post it Wednesday, so you have time to go buy the ingredients. 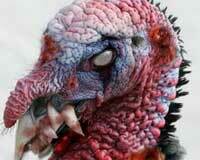 This entry was tagged Goblinproofing One's Chicken Coop, Huffington Post Weird News, Thanksgiving, Varla Ventura. Bookmark the permalink.